There came a point after devouring much of what was on the science fiction shelves at the local library from the age of 8 that I started to get a sense of who some of the writers were beyond their books. 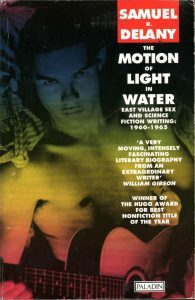 When I came across Samuel R Delany’s The Motion Of Light On Water as a 17 year old I was ready for it in ways I hadn’t anticipated. It was an immersion not just in the mind of a luminary talent, an African-American seeking to discover who he was not just through experimental prose but in every other way. Early sixties New York is brought to vivid life in the text, Delany one of the singers on the folk scene that spawned Dylan. That fusion of art and politics runs through his work and life, and the way Delany seeks to find and assert himself as a black gay man, at that point married to poet Marilyn Hacker, is a life-affirming and chaotic adventure. It dissolved many of the limiting ideas I’d acquired though schooling and the local norms that prevailed, and helped make me aware what’s out there if you’re determined to discover for sure who you are and what you’re capable of. A magical text.